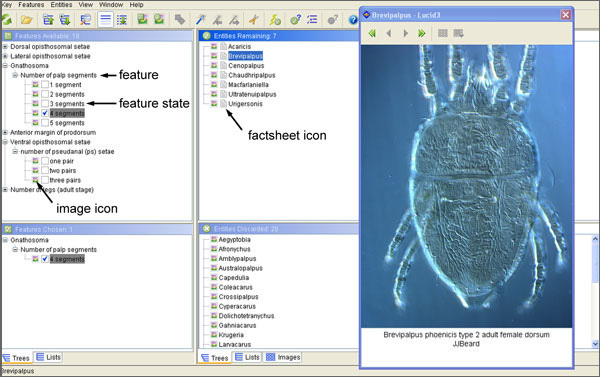 Flat Mites of the World includes four interactive keys: one to all the genera in the family; one to species in the genus Raoiella; one key to several species in the genus Brevipalpus; and one key for several species of Cenopalpus. Clicking on the Keys link will take you to a page to help you decide which key you should use. Details for using the key are provided below. For information on using the Lucid3 Player, please view the help files for the player, which can be accessed in the player. An interactive matrix-key is quite different from a traditional dichotomous key. The user is recommended to consult the Best Practices on occasion to pick up new tips and tricks for using the interactive keys. Note also that web pages such as fact sheets attached to items in Lucid3 keys may be considered pop-ups by certain browsers (such as Internet Explorer) when clicked on by users. If your browser blocks these pop-ups, you should allow pop-ups for this Lucid tool in your browser's Internet settings. A Lucid key has four panels. The upper left window Features Available lists the identification features and feature states to choose from. The upper right window Entities Remaining lists the available taxa. The lower left window Features Chosen lists which feature states are currently selected. The lower right window Entities Discarded lists the taxa that have been discarded based on the features that have been selected. The features used in this tool have been grouped into regions of the body. If the user has a damaged specimen, there will still be other features available on undamaged parts of the body. All feature states are illustrated, either by a photograph (in most cases) or by line drawings. Most genera are illustrated with labeled line drawings of a particular representative species. Photographs are provided for significant genera, and where available for other genera. Please note that the images provided do not necessarily reflect all known morphological variation within the genus. Every diagnosis should be confirmed by carefully reviewing the information provided on the fact sheet (information on separating similar genera is available in the fact sheets). All species are illustrated with labeled photographs and in most cases labeled line drawings. Again, every diagnosis should be confirmed by carefully reviewing the information provided on the fact sheets. Feature and entity trees can be expanded by clicking the "+" next to the grouping feature or entity. Feature states are selected by clicking once on the state name or image thumbnail. Clicking the state a second time deselects the state. As feature states are selected, the entities that do not have those features will be moved into the Entities Discarded panel. All entities and feature states are illustrated with photographs and/or drawings. Clicking on the image thumbnail (or image icon if thumbnails are not displayed) brings up a larger size image and gives the user access to the full image gallery for the feature state or entity, if available. All entities are also linked to fact sheets for the taxon. Clicking the small grey page icon next to the entity thumbnail will open the fact sheet in a new browser tab or window. In the key itself, many common language terms are used to help support use of the key by inexperienced individuals. However, in order to maximize their value and validity, some specialized terminology appears in the fact sheets. A glossary with links from the fact sheets is provided to assist the user in understanding such terms. 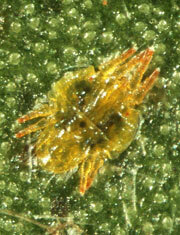 An illustrated guide to flat mite anatomy and terminology is also included in the Is it a flat mite? page. If unsure of the correct state of a given feature, it is often better to try a different feature before selecting a state you are unsure about. However, the key has been coded to accommodate common mistakes and features with states that may vary. For more hints on navigating the keys, see the Best Practices page.